"Muy buen servicio, ha sido rapidísimo el envio, todo perfecto y comparándola..."
Strands of 10 mm round beads of Tiger Eye. Measures of each strand of 10 mm tiger eye round beads: · String with about 40 cm in length. · Contains 38 balls and weighs 60 gr. approximately. Strands of 4 mm round beads of Tiger Eye. Measures approx. 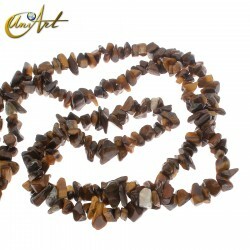 of strands of 4 mm tiger eye round beads: Measured approximately 40 cm long. In medium containing 96 tiger eye beads and weighs about 10g. .
Strand of 6 mm bull eye gemstone round beads. Approximate measures of the bull eye strand 6 mm round beads: · Strand with about 40 cm in length. · Contains 64 balls and weighs 25 gr. 8 mm round beads of Bull Eye stone. Approximate measures of the bull eye strand 8 mm beads: · Strand with about 40 cm in length. · Contains 48 balls and weighs 34 gr. Strand of 10 mm round beads of Bull Eye. Approximate measures of the bull eye strand 10 mm beads: · Strand with about 40 cm in length. · Contains 38 balls and weighs 60 gr. 8 mm round beads of Tiger Eye. Measures: · String with about 40 cm in length. · Contains 52 balls and weighs 35 gr. approximately. 6 mm round beads of Tiger Eye. Measures: · String with about 40 cm in length. · Contains 66 balls and weighs 23 gr. approximately.